The NC Supreme Court race last Tuesday between sitting justice Bob Edmunds and Mike Morgan came out with Morgan far on top. He's the Democrat. Edmunds was the Republican backed by big corporate donors. 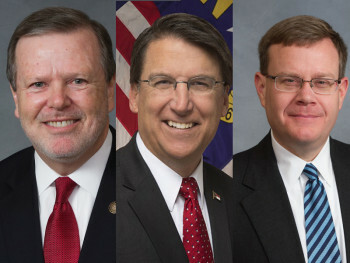 The Overlords in the General Assembly -- Phil Berger in the Senate and Tim Moore in the House -- had tried to save Edmunds by changing the election law in that race alone to a plebiscite vote, so that Edmunds would not have to face an actual challenger. The Berger-Moore law change would have put Edmunds on the ballot by himself. Voters would be asked to choose "Yes" or "No." That innovation got overturned as unconstitutional by a specially appointed three-judge panel, and that decision was subsequently upheld by a tied NC Supreme Court. The high court voted 3-3 to uphold the three-judge panel, mainly because Bob Edmunds had to recuse himself from the case. Edmunds lost last Tuesday, bigly (54.45% to 45.55%). 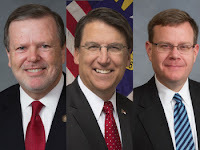 Now Berger-Moore, with the willing participation of also defeated Governor McCrory, intend to pack the Supreme Court in a special session next month with two more Republican judges before McCrory has to pack his bags and leave. Mark our words: They will do it. Because they can. And because they do not care what anyone thinks. They only care about ensuring that the unconstitutional laws they pass will get a stamp of approval from the state's Supreme Court. Roosevelt tried to do that and he was shot down. There must be case law.